The Global Electric AC Motors Market is expected to reach USD 146.6 billion by 2025, according to a new report by Hexa Reports. These products are widely used in compressors, fixed cranes, diesel electric engines, and domestic appliances. Their key advantages, such as cost-effectiveness and efficient operation in harsh environments, are making them suitable for a variety of applications. These high-efficiency products are likely to witness huge growth, owing to their low maintenance requirements, long operating life, and low power consumption. The rising global demand for AC motors-driven engines is also spurring the market growth. Furthermore, factors, such as growing demand for HVAC equipment and industrial machinery, are projected to propel the market demand by 2025. AC motors have undergone numerous technological advancements over the past few years, which have resulted in increased demand for these motors. 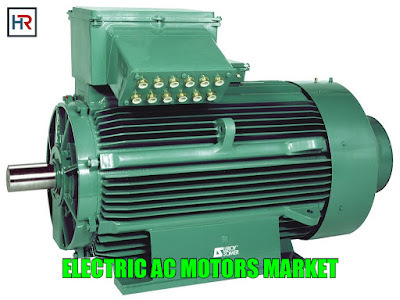 The electric AC motors market is anticipated to witness substantial growth over the forecast period, owing to the rising number of industries across developed and developing countries. The market is further driven by the extensive adoption of these products in diverse industrial equipment such as fixed cranes, conveyor belts, electric saw, and so on. The ever-rising fuel prices and mounting need among consumers for using cleaner sources of energy has driven the market growth for electric motors in the recent years. An AC motor acts as the key component of electric motors is likely to drive the demand. Furthermore, increasing environmental concerns and rising government initiatives pertaining to environment conservation continue to be the key drivers of the market growth. HVAC systems are largely employed in various places such as commercial spaces, offices, and shopping malls. The growing rate of urbanization and enhanced standard of living have led to the large-scale installation of HVAC systems. AC motors are used in HVAC equipment to power air blowers that regulate air flow. The ability of AC type to operate at different speeds, along with the increased dependability and operational efficiency of an equipment, is anticipated to lead to an increase in their adoption over the forecast period. The key players, such as ABB Ltd., Toshiba, Baldor Electric Co., and Siemens AG, dominated the market in 2016 and focus on increasing market presence through mergers and acquisitions.